Have you been/are you planning on participating in the National Novel Writing Month (known to most folks as NANOWRIMO) challenge? We wanna hear about it! Email documents, comments, and links to submissions[at]steampunklibrary[dot]net. Share your vlog updates; share your stories; share your favorite author podcast about tips for writing. If you need inspiration, you’re not alone, so send us your favorite steampunk story, website, or artwork and we’ll post it here and via the Steampunk Library Project Twitter page (@SteamLib) to help inspire your fellow participants. Is your library (or school, or book group, or even just you and your friends) hosting a NANOWRIMO event? Check out this nifty idea for creating novel finishing kits. 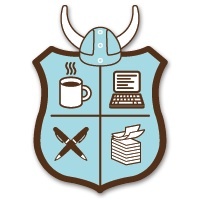 Wanna learn more about NANOWRIMO and how to get involved? Visit the official website for all the details. Good luck to all participants in the 2014 challenge! National Novel Writing Month – every November writers of all levels take the challenge to write a full novel (or at least a good chunk of one) in the month of November. The challenge is supported through social media campaigns, writing groups, and web tracking via nanowrimo.org. The site also hosts postings related to writing help and organizes local events. As librarians, we can encourage writers to use the library as their writing space, research space, or just a place to come and get support as they take on hundreds of words a day. This project is designed to show that support while also spreading the word to those who may not have heard of NaNoWriMo. Images of canisters filled with tools to help writers have been floating around Tumblr and Pinterest, and the idea can be easily modified to help support Steampunk writers in November. Steampunk: small pictures of Steampunk machines, note cards with quotes like “Steampunk creations may be mechanical, sculptural, or purely decorative… Whatever the application, the art celebrates a time when new technology was produced, not by large corporations, but by talented and independent artisans and inventors” from Art Donovan’s The Art of Steampunk (2011), tiny paper mustaches, top hats, and a small list of in house resources. The outside of the canister can be decorated with more paper top hats and closed with corset-lace styled ribbons. Fantasy: A canister covered with a glittery paper dragon is attention grabbing no mater it’s location in the library. Filled with a wand, a list of online creature name generators, and quotes from J. K. Rowling, Tolkien, and Goodkind the magic is sure to start flowing. Romance: A deep red canister filled with chocolates; who wouldn’t fall in love with a little chocolaty inspiration? Cards filled with synonyms for “love” (predilection, delight, adoration), pictures of the sunset, and a list ‘legitimate’ authors who also write romance (like Sabrina Jeffries who earned her PhD on James Joyce but makes her living writing romance) are sure to get blood pumping. Children: NaNoWriMo isn’t just for grown-ups! This idea can also be easily modified for children, particularly during a day camp. Give each child a canister filled with a sentence starter (“Then suddenly the door opened”, etc), a few pictures, and a character name. Give them time to write a story using all the pieces from their canister and have them share with the group.